Ofiget! Can it really be? Going alone to Saint Petersburg - or Санкт Петербург as it is written in Russian...on paper it sounds like quite a challenge. Facts include very few or no signposts, street names, metro names, bus route information, train tables etc. written with latin letters. Most of it is in Russian - letters based on the cyrillic alphabet. Now this calls for quite a lot of planning...apart from the usual scouring of literature, websites for information about sights and places to see, how to get around, get from the airport to the city centre etc. This calls for the study of a rather cryptic looking alphabet and language. Was that all? Seriously though..it is possible to learn, it just takes a bit of time, effort and discipline. But it is far from impossible - it just looks very intimidating at first. I spent a fair amount of time on Tripadvisor, searching for good accommodation. In the end, the hotel of choice was the Renaissance Baltic St Petersburg, due to its high standard, high rating and central location. I left for Gardermoen airport very late in the night to sleep there. Since my flight path started at 08:45 I felt it was better to wake up and have a good breakfast at the airport instead of driving in the middle of the night and risking incidents that might prevent me from making my flight in time. Still...I arrived very late and ended up with only 4 1/2 hours of sleep..not really enough. Anyway...a 1h05min flight with Finnair sees me to Helsinki-Vantaa for a wait of nearly 3 hours before my 35 min flight to 'Piter' as the natives call it - during which time I find out about the winner of the Nobel Peace Prize on the news. Hm. The flights are uneventful...twice an Embraer E170 jet..a fairly small one, but these may not be the most trafficked routes around I guess. The onboard meals are very simple - bread with cheese - still, more than SAS serves (which is nothing). We are served immigration papers shortly before landing preparations - there was not even enough time to complete filling these ones out. I get a long glimpse of the city from the air as we make the approach towards Pulkovo - 2 (Пулково - 2) and can make out the main course of the river Neva (Река Нева). During the short bus ride from the plane to the terminal comes the first reading challenge - planes bearing the РУССИЯ logo - I identify them as belonging to the Rossiya airline, which is as far as I know based in St Petersburg. Once inside, I complete my immigration papers and head for the passport control. Hmm..no lines at all. Is this the visa control, or is there more ahead, I wonder? I head to the booth and after 90 seconds I am let inside. Once on the inside, my suitcase is already waiting for me. I check my watch as I come into the arrivals hall - after a scheduled landing at 15:50 it has taken me less than 10 minutes to get to the exit and ready for the next stage - getting to the city centre. I jump in and ask the driver for confirmation - Сенная Площадь? He nods his head. I have some help putting my suitcase in the back of the car (which I follow just in case), and hand him the fare for the entire trip to the city centre - 26 руб (RUB - roubles), which would be something like 0.6 €. My alternative would be either a bus or another marshrutka to the metro station Moskovskaya (Московская), then the metro for six stops to Sennaya Ploshchad' - with lots of stuff to carry on the metro - at 16:30 on a friday. The marshrutka option seemed more relaxing, even though there was very little legroom. I watch as the buildings speed past or grind by depending on the traffic situation - there is not enough time to practice my alphabet skills on all of them...I find myself still reading too slowly. 'You need more practice, tourist!' I tell myself - I expect I will have it during the four coming days. As I get St Isaac's Cathedral (Исаакиевский Собор - Isaakievskiy Sobor) into full view with a perfect blue sky behind and the sun illuminating the gold-covered cupola, I can't help it...I have to stop, put aside my suitcase and pull out my camera and shoot it (in a gentle way of course). My hotel is located on Pochtamtskaya ulitsa (Почтамтская Улитса), just a few steps from the cathedral. I reach it only 1,5 hours after stepping through passport control - not too bad, considering friday afternoon traffic! The hotel looks great on the inside - there is a wide open atrium into which most rooms face, and a glass roof on top of this. There is a winding staircase leading up to a ballroom which is closed during my stay. And there is a bar and of course dining room which also serves as breakfast room in the morning - the Canvas restaurant. My room is spacious enough, has two windows which do not open (for safety reasons I am sure), and two huge twin beds with an assortment of pillows - guaranteed to satisfy even the most picky foreigner. The air conditioning works quite well - it is cold in the room. There's also a minibar, a safe, and a bottle of complimentary water which is exchanged every day. In the summertime, there is a bar on the 6th floor which overlooks the cathedral, and in the basement there is a very well equipped gym room. The hotel also features a souvenir shop and two bankomats as well as a serviced bank (Western Union branch). Well...before I have fully settled in I decide to go for a short walk - initial sightseeing and get-to-know-your-surroundings. I head past the cathedral on the northwest side, along a green park which leads to the Admirality (Адмиралтейство - Admiralteystvo). The cathedral is in fact one of the largest in the world (the dome rises 102 metres above the ground), opened in 1858 and is today - as it was during the Soviet era - a museum and not a religious place. It is possible to walk up to the colonnade for an extra fee and get some great views over the city and the nearby buildings. Not today...maybe tomorrow...it is a bit late already (past 7 in the evening). I head past the Admirality, then on to Palace Square (Дворцовая Площадь - Dvortsovaya Ploshchad'). It is huge, facing the Winter Palace, which is part of The Hermitage (Эрмитаж - Ermitazh) to the north and the General Staff Building (the headquarters for the Russian army) to the south. In the middle of the square, the 47 metre high Alexander column rises, commemorating the victory in part of Tsar Alexander I over Napoleon. Due to its immense weight and precise mathematical calculations, there is no support below the column. Off to one side of the square, I stumble over a peculiar sight - a bus with the sign ТУАЛЕТ - toilet. This must be the biggest portable one I have seen...a full-size bus rebuilt into a toilet. Entrance on one side, exit tubes leading down into the manholes on the other side. As the last rays of sun hit the Winter Palace and the sky turns a dark pink behind the somewhat distant Admirality, I feel that the day has been quite successful. I head back to the hotel for some rest and to freshen up before browsing through a brochure in order to find some place to have dinner. I settle for a nearby place - Tandoori Nights; indian cuisine on this occasion. A clever design with traffic lights informs pedestrians and drivers alike the time that is left of either green or red light. Traffic is sometimes quite heavy, some drive fast, some more gently...but at least most seem to stop when they do a turn over the zebra crossings. Great...the road I planned to walk is completely closed due to construction. I have to make my way around St Isaac's instead, but eventually I get there. A small but intimate restaurant in a basement - complete with a small fish tank and a big TV screen showing low quality Bollywood music VCD's. The food is great though...I go for a more or less classic tikka style dish and red wine, feeling I have deserved it. I hope. As I have my camera with me, I can't wait...I have to head over to Palace square to see what it looks like at night time, and boy is it amazing! As I have not brought my tripod, I try my best to rest against a lamp post to steady myself for my shots...most end up quite ok. It is past 1 in the night before I finally dive into bed! According to the weather forecast posted inside the hotel elevator as well as the small note placed in my room, the day today will be up to 8°C and sunny. Since I also read on a travel forum before leaving and my hotel brochure 'St Petersburg in your pocket' confirms this - namely that the fountains of Peterhof (Петергоф) will be running until the 11th October - I feel lucky today, so I decide to go there. I ask at the hotel if they know whether the hydrofoil service from the Palace embankment is still running - it seems it isn't. I am left with three options: metro + train, metro + bus or metro + marshrutka. I decide to find out once I get to the metro station of choice which one I will go for. I head back for my 'old' station at Sennaya Ploshchad' - from here I take the metro one stop to Tekhnologicheskiy Institut (Технологический Институт), switch to another line and go one stop to Baltiyskaya (Балтийская). Only one metro ticket is necessary for this, in fact you can ride around the entire city on one ticket, as long as you do not take the escalators back up. Once on the outside, I try to get my bearings again and one of the first things I see is marshrutka K-404, which I remember from my hotel guide brochure will take me straight to Peterhof, and indeed the hand written sign says Петергоф. The fare is 50 руб - still very much a bargain. The ride takes the better part of an hour due to traffic - Peterhof is situated almost 30 km outside the city, towards the west, and facing the Gulf of Finland. I spot an onion-roofed church on the way, and think to myself 'aaa I want to take a picture of this!' but Lady Fortune seems to be in a good mood - 200 metres further ahead is the official entrance to Peterhof. The back side of the palace...the lower gardens...a checkerboard floor...37 golden statues...64 fountains...142 water jets...and the canal leading down to the docks and the bay. It is too overwhelming at first...it takes time to get used to it - if this is at all possible - one has to walk around the place for some time, seeing everything from different angles, walk down the stairs, along the canal, cross a bridge, walk back up...then maybe do it a second time. Lots of photos taken...it is windy, and small drops of water from the fountains stick to my solar protection cover. There are quite a few people here, but it is not overly crowded. Some groups, only very few foreigners...as well as some school groups...almost all the words I hear seem to be Russian. The fountains were not part of the original design - they have been added slowly over time. There are no pumps here - the water supply comes from some hills through 40 km of pipes, so the height difference alone gives enough pressure to support them. There is a separate entrance fee with a possible guided tour inside the palace itself. I decide to skip it - it would only result in more waiting, and I believe I will focus on the Winter Palace instead. Besides...my tummy tells me it is well past lunch time...so I decide to follow the signs towards 'Ресторан' - restaurant with reasonable prices. First of all I find something which looks like a fast food snack bar - they offer pizzas, burgers, soft drinks etc. Not my favourite food when sightseeing - besides it is lunch time and I would prefer to try some local cuisine! I finally manage to notice that the rather small building to the side is a separate restaurant - Ресторан Штандарт (Restaurant Shtandart) - it does not mean it is a below-average one though. Once inside, the room is quite cozy with wooden floors and walls, and dressed up waiters. The menu looks interesting - so I decide to try the wild boar. After a while the waiter comes back and says he cannot find it in the Russian menu. My alternatives are bear or venison - they recommend the venison in particular (no doubt because it is 50% more pricey than the bear), but anyway...I decide to try it. And some local bread. And red wine. This ended up being my most expensive meal - 1200 руб - but it certainly was good! The plate was typically gourmet-garnished, three separate pieces of meat around circularly shaped mashed potatoes - and with a wonderful mushroom sauce and extra mushrooms. The wine and bread was good too! It is time to head back to the exit and get back home. I haven't explored the entire park, but I wanted to focus on the fountains instead. Besides...it is getting quite cold and my nose is starting to run (more). As I cross the street outside the palace grounds, I head back to the onion roofed church and get a fairly good picture of it as some raindrops fall. I head back to a bus stop, and hope I will be able to see the marshrutka and will be able to test the theory of stopping them by holding out your hand. No sweat...it works like a charm, and the K-404 is easily identified. Getting back to Baltiyskaya takes an hour due to some traffic problems...but I will not head back to my hotel just yet. My trusty guidebook (DK Eyewitness Guides) shows a pic of one of the prettiest metro stations, namely Avtoto (Автово), and I see it is only three steps from Baltiyskaya, although in the wrong direction. I go there and admire it for a while - it is indeed beautiful...like an underground palace, but there are lots of people all around, and even though I wish to sneak myself to taking a pic, I know it is not normally allowed...so I decide not to I hop back on to the metro again...and by the time I return to my hotel I find that I have spent around 6 hours on this trip alone. After a short rest at the hotel (there is little rest for the weary anyway - I can sleep when I am dead) I decide to head out and follow the Canal Griboedova (Канал Грибоедова). I follow it until I reach Nevskiy Prospekt (Невский Проспект), where I see the Cathedral of Our Lady of Kazan (Собор Казанской Богоматерй - Sobor Kazanskoy Bogomatery). It was built in the early 1800s and clearly modelled after St Peter's square and church in Rome and the dome stands around 80 metres above the ground. A bit further along the canal and I find myself at one of the major icons of the city - the Church on Spilled Blood (Храм Спаса-на-Крови - Khram Spasa-na-Krovi). It was built on the spot of the assassination of Tsar Alexander II, which happened in 1881. Building commenced in 1883. Both the outside and inside is adorned with magnificent mosaics of more than 20 types of minerals. It opened in 1998 after more than 20 years of restoration work - apparently is was used as a storehouse during the Soviet era. The onion roofed church separates itself from some of the other more western-inspired ones around the city - this one is definitely more exotic, more Russian. Some of the domes look like candies...I wonder if they will let me up to lick them? After another half hour it is time to head back to the hotel...and to find some place to eat. I decide to go for a greek restaurant, which is very close by, just off to the side from the hotel Astoria. As I walk on a zebra, a passing guy says something to me. I decide to reply 'Я не понимаю' - 'Ya ne ponimayu' - 'I don't understand'. 'Не понимаю?' he replies, smiles, and walks on. The restaurant seems to have a live-music-event this evening, which adds an entrance charge but gives an extra salad (a very yummy one). I go for a pork dish which I do not remember the name of, and some white wine. In my non-smoking room there is only one other group of people - some friends/couples celebrating or something, as some seem to have had a fair bit to drink. The mood is good anyway, and even though one of the guys decides to take along one of the chairs at my table as he passes by in a wide arc, he puts it back and says 'извините' - izvinite (excuse me). On my way back, as I see a police car stopping by the side of the road just as I pass it, I realize I forgot my passport or backup copy of it. Fortunately most police cars at this hour seem to be focused on keeping a watchful eye on traffic, especially in intersections. A bit of extra excitement there...phew. Another long day and late night comes to an end - I feel my back and shoulders beginning to seriously ache. I hope I will survive the next day. I hope my bed will repair me. Again past midnight...zzzzzzzzz. Two main attractions remain which are centrally located and fairly close to each other - one being of course the State Hermitage Museum (Государственный Эрмитаж - Gosudarstvennyi Ermitazh), the other being the Peter & Paul Fortress (Петропавловская Крепост - Petropavlovskaya Krepost). These ones should be easy enough to combine as a half-day trip or so, as I do not plan to spend hours and hours inside the Hermitage. Again I head to my old buddy Sennaya Ploshchad' for a metro ride. I expect it to be a long one, as it will cross the river Neva before I reach my planned destination station - Gorkovskaya (Горковская). But the metro ride seems especially long - and I see the cars slowing down at some point where there is light and some workers are doing some...work, before it speeds up again and goes far...before finally stopping. As I get out and read the name of the station - Петроградская - Petrogradskaya - I begin to worry. I find out that Gorkovskaya station is closed. I saw no indication of this anywhere. Great! Do I take the metro back again, or do I walk all the way back to the Peter & Paul Fortress from here? After some minutes of decision making, I head out into the street and look around. Which side am I on? There is a long street which disappears into the horizon either way. I have to study my map and look at the sun before I find out I am on the east side of the road, and will thus have to turn left to get to the fortress. After a pretty long walk I finally see the park in front of it, head through and see the bridge leading to one of the fortress gates. An official looking man seems to want to stop me and says something to me in Russian. I shrug, indicating I do not understand. He says something more in Russian, and I still do not understand. Do I need a special permit or ticket to enter the fortress, I wonder. 'Boat trip' he says finally. 'Aaah... Нет спасибо!' (Net, spasibo! No, thanks!) I reply. 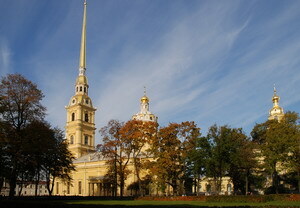 The Peter & Paul Fortress is the oldest remaining building in the city. In fact, one might call this the pillar of the city from 1703. A fortress was build on a natural island to protect what would later be the city of St Petersburg. The fortress has some dark history as well - it was originally built in wood and later replaced piece by piece in stone. Hundreds of forced labourers died while building the fortress, and its bastions was used as prisons and places of torture for political prisoners. The jewel of the crown is without doubt the Cathedral of Peter & Paul (Петропавговский собор - Petropavlovskiy sobor). It was designed by Domenico Trezzini in 1712, completed in 1733 and the magnificent golden spire rises 122 metres above the ground. 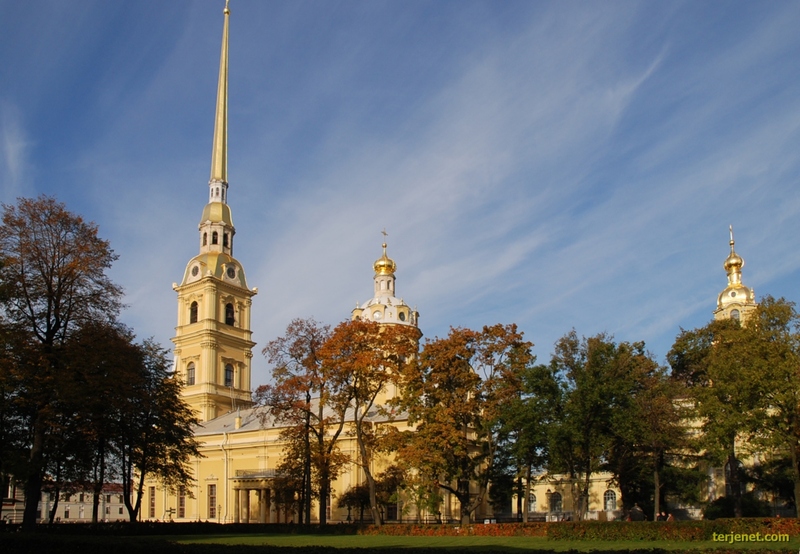 Inside the cathedral are the tombs of the tsars, including the members of the last Romanovs. Once on the outside of the fortress, I pass a beautifully maintained ship which seems to be permanently anchored here. What is most surprising is that there seems to be a gym on the bottom level - I see people on treadmills there! Otherwise it seems to be a restaurant of sorts. I head across Birzhevoy Most (Биржевой Мост) to Vasilievskiy island (Васильевский остров) and round the Naval Museum (previously the stock exchange). Outside stand two rostral columns, originally intended to serve as beacons of light. At their bases, marble figures represent the great rivers of Russia: Volga, Dnieper, Neva and Volkhov (even though Neva is only 74 km long, it is very impressive volume wise). At the mouth of the river, it splits into two parts which encompass Vasilievsky Island - Bolshaya (Болшая Нева) Neva and Malaya Neva (Малая Нева) цруку bolshaya means large and malaya small, and the -aya ending refers to Neva as female. At 12 o'clock sharp, a cannon on one of the bastions of the Peter & Paul fortress shoots one salva, for people to check their watches - a tradition which has been kept since 1736. Little did I know of it before I found out the hard way...I was wondering if there was a war or bomb attack somewhere. The ground shook, starting off several car alarms, and I heard a siren nearby. I decided to continue along the small artificial spit or Strelka (Стрелка) before crossing Dvortsovy Most (Дворцовй Мост) and finally towards Palace Square - and inside! The normal price - or price for foreigners - is 350 руб, while the cost for Russians is 100. They pay a subsidised price for entry, which in my eyes is not a bad idea - it enables most residents to be able to enjoy this treasure as well. I pay an additional 200 руб for a photo permit. As I head in, I am stopped and made aware I have to leave my jacket in the wardrobe. It makes sense, I think. Another try, and I am let in - thankfully my photo bad is allowed, as it would be difficult to hold my camera in my hand all the time while navigating through the palace. I didn't read much about the inside of the palace, apart from a couple of rooms that I know I should see - in particular the grand staircase, which I happen upon straight away, and it is a most impressive thing to see! From here on, I start to wander from room to room, taking some pics here and there, marvelling at the sheer size, beauty and decorations, glancing on a piece of art here and there...before finally finding out that I should have brought some kind of map after all - it is quite easy to get lost here, with some rooms having four exits into either other rooms or hallways with further exits in either direction. As I continue to navigate (or more precisely, wander aimlessly around) my tummy reminds me that it was a bad idea to get in line for the palace tour before lunch. As I see now, it will be past 4 in the afternoon before I am finished - if I do my own 'short tour'. Room after room...one art department after another...European art, old art, Egyptian, Far East, Russian...after 90 minutes I head for the exit. It is too much to devour in one go. I read some place that if you spend 1 minute looking at every piece of art in the museum, and the museum had been open all days of the year, it would take 8 years to get through everything. I buy a souvenir from the museum shop - a DVD with the major sights of the city, and later find out some impressive numbers about the site: the exhibition itself (accessible museum area) covers 353 rooms, there are more than 2 million exhibits (according to wikipedia, there are nearly 3 million. Who is counting?) The palace's total area is 10400 square metres, with a total of 1050 rooms, 1886 doors, 1945 windows, and 117 staircases. Can you say Офигет (ofiget ≈ oh my god)?? The palace was founded in 1764 by Catherine the Great but was only opened to the public in 1852. In addition to the Winter Palace, the buildings comprising the Hermitage that are accessible to the public are the Small Hermitage, Old Hermitage and New Hermitage. The Winter Palace itself was the main residence of the Russian tsars, but Catherine the Great was an art lover. During her lifetime she acquired 4000 paintings, 38000 books, 10000 engraved gems, 16000 coins and medals as well as a natural history collection filling two galleries. Before this, the collection overgrew the building, and the Old Hermitage was added in 1787, as well as a private theatre. Enough with numbers - lunch or I will die! I head back to the hotel and wonder what to choose - I would really like some Russian cuisine again. I still haven't tried the borsht! I check my small brochure and consider a place called 'Krokodil' (Крокодил) on 18 Galernaya ulitsa (Галепная улитса). But for some reason I end up forgetting the number, thinking it is 30-something. Too much on my mind...too many impressions...too many thoughts...after walking for 15 minutes in the same direction with no success, I reverse my steps along the parallel street - Konnogvardeiskiy boulevard (Конногвардеиский бульвар). On my way back I see the sign 'Russian vodka museum' as well as the interesting letters 'Ресторан' (Restoran). I have a brief look at the menu outside and confirm reasonable prices as well as the availability of borsht! Finally! As I head inside and two official welcomers say 'здравствуйте' (zdravstvuyte) I wonder if I need a table reservation to qualify for a place inside. It seems I do not - at least not for lunch. There is a separate manned wardrobe, and I manage to hang on to my camera even though he wants it in the wardrobe too. I want to document my lunch...and head inside the restaurant, which is empty apart from two others in a corner. I order Ukrainian style borsht, pirozhk, and blini for dessert. No wine for lunch today...not on a stomach resembling a raisin! And certainly no vodka, even though I am in the museum! Nope...sparkling water for you today, malchik! The borsht is surprisingly good, and is complete with a small dose of sour cream. It reminds me of Hungarian goulash soup, only milder, and of course with beetroot, which is its base. But it does not taste like the pickled beetroot I have tried at home - fortunately, I might add. The pirozhki are stuffed with raindeer meat - they are ok, but not a wow-experience. The (sweet) blinis are quite good though - a mild type of small pancakes. Mission complete. I have survived. Time to head back to the hotel...and stretch out to try to soothe my shoulder and back muscles, which are killing me by now. I wish to visit St Isaac's cathedral and go to the roof for a great view of the city...but I need to rest! I decide to heal up instead and have a good rest before going out for dinner not much later. Tandoori nights again - but it is good! Tomorrow I will try something else...it's a promise! I finish the day with a drink in the bar before bedtime. I cannot remember the drink (cocktail) but it was good. As I slowly sip at it, I lose myself in my thoughts...my expression must have seemed distant, as I somewhere at the edge of my vision notice the bar girl stopping by my table, cocking her head and hesitating before asking if I would like another drink. I manage to snap out of my thoughts and reply with a 'no, thank you'. How can one day with such terrible weather - horizontal snow and an icy cold wind during the first half of the day - pass by so fast? How is it possible that these 24 hours just pass by when they end up feeling like only a couple of hours? 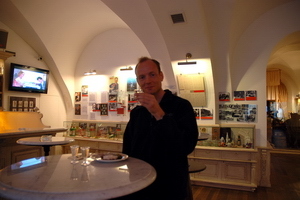 I visited Nevskiy Prospekt (Невский Проспект), including one of the small Chocolate Museums (Музей Чоколада) on number 17. It is truly amazing what they can do with this material. The museum is small, but items on display are for sale. I visited the Russian vodka museum - this time for a guided tour including samples at the end! One shot glass of pure vodka, one with added cranberry (if I remember correctly) taste, and one with honey taste - all 40%. In addition pickled cuecumber and rye bread with pieces of fish. So how was it? Well, vodka is...spirit. It has little taste of its own. The second one was the best...so now I can say I have been to Russia and tasted vodka - and found my way back after! I rush out for a matryoshka. As I check out and start the lonely walk towards Sennaya Ploshchad', I feel as if I have left behind a part of me.